If there was an easy, effective way to dramatically improve your recruitment results … would you want to know? Of course you would! Who’s the sharpest student you know? If you had something incredibly important to get done that you couldn’t do yourself, who would you ask? If the school gave a scholarship for knowing the most people on campus, who deserves the money? When I say "gentleman" or "classy woman" who comes to mind? Do you have a roommate? Who do you know that seems to have a special leadership gift that others want to follow them? Who comes to mind as the best example of "work hard and play hard?" If I wanted to meet the best and brightest students/freshmen on campus, who are 2 people I’d have to meet? Who’s the best example on campus of student people listen to when they talk? Who are the 2-3 most impressive guys/women on campus? These are the questions I ask students, Greeks, non-Greeks, first-year students, parents, student government, faculty, police, dining hall staff, RA’s, community leaders, priests, admissions staff, coaches, and even the people going through Formal Rush. That’s right, every person is a connection to more high-quality students … if you ask the right questions more often. In my current role I serve as a graduate advisor in the Office of New Student Connections at the University of South Florida. Currently in my office we have been exploring Simon Sinek’s TED talk “How Great Leaders Inspire Action” which can be found here . In Simon’s TED talk one of the main lessons the viewer learns is that, “People don’t buy what you do; people buy why you do it.” He shows this through his concept of the “Golden Circle”. Through this Golden Circle, Simon tells us that every organization knows what they do, some know how they do that, but very few know why they do it. When listening to this conversation and thinking of examples, my mind could only go back to thinking of our fraternal organizations and how we can continue to grow them by using this concept. By knowing our individual organization’s “why” we can continue to recruit more great, quality student leaders. When we know the why, we can continue to sell our groups to potential new members. This was something that I had done as my organization’s recruitment chair and did not even realize it at the time. In Simon’s TED talk he uses the company Apple as an example. Apple sells us the “Why”, they tell us how they believe they challenge the status quo, how they make their products beautifully designed and user friendly. They then introduce us the idea of buying a computer. We are more enticed to buy a computer as a consumer when we know the why. By following this concept of working backwards from the why, we can apply this to our organizations. If we can articulate the why through recruitment, whether that be brotherhood, sisterhood, lifelong friendship, socially excellent leaders, whatever your why is, we can continue to recruit higher quality and quantities of students on our campuses. Simon Sinek also said, “If you hire people just because they can do a job, they’ll work for your money. But if you hire people who believe what you believe, they’ll work for you with blood and sweat and tears.” By recruiting these leaders who believe what your organization believes, they are more likely to be invested in the group and more likely to give back to the organization. This may be through being an involved member, holding a chair position or even being the chapter president. So with that, examine your WHY; what get’s your organization Phired Up, why do you exist, what did your founders intend, etc. By examining this, your organization will continue to recruit better and higher quality leaders. We say this pretty frequently, most typically when we’re having trouble convincing non-affiliated students to be a part of our organizations (or judging them for not being a part of a fraternity or sorority). And man, do I agree. I used to think that I got it. I was sure that I understood this whole “sorority thing” even though I was not a part of it, wasn’t a member (read my story here ). I had served as a house director for a sorority. I had volunteered during sorority formal recruitment. I had done research about the fraternity and sorority experience. All my close friends were in fraternities and sororities. I knew what “philanthropy” was and I had read the book Pledged . Everything I needed to know about being a member of a sorority, I knew. And from all I’d read and seen, I was sure that I understood what it meant to be a part of one of our organizations. I’m going to say that again, because frankly, I don’t say that often. I was wrong. How do I know I was wrong? I was invited to become a member of a sorority. So, now that I am a member I can say this: yes, I agree. I agree that it is difficult to understand what it really means or what it’s really like to be in a sorority until you are actually a part of it. Give yourself a self-five; you nailed it! Truly, I really didn’t get it until I was in it. And now it’s time for the catch (of course there’s a catch). We use this as an out, as an excuse for why it’s not worth it to try to show the non-affiliated students otherwise, an excuse for why we shouldn’t try to recruit them. But this shouldn’t be our excuse: this should be our solution. To me, this sentence really just sounds like surrender—they’ll never get it, so why try, right? And let’s be honest—it’s a little valid; a non-affiliated student likely would have a difficult time identifying with some of pieces of our world (i.e. Ritual). The words aren’t wrong; the attitude is. It’s no one’s fault and it’s not bad or negative; most importantly, it is certainly not a reflection of their fit in your organization or their sorority aptitude. It simply means that, just like you and me before we were initiated, perhaps no one has yet shared with them the outrageous and powerful benefits of sorority. It doesn’t always mean they hate you, or that they will never want to join you; it just means that they’re missing something. Something only we can provide to them. The next time you get tired of trying to make friends with non-affiliated women, next time you feel judged by non-sorority women or non-fraternity men and you think or even say out loud “they just can’t get it if they’re not in it,” remember this: your excuse for why it might not feel worth it to connect with them is exactly why it is worth it. Use it as your fuel for connecting with them. Reach out and find out what they understand sorority to mean. Help them see what it means to you. Share with them those outrageous and powerful benefits of your sorority experience (which, yes, you can do without sharing any of our secrets!). Sorority women proved me wrong by sharing with me what about this experience I didn’t understand from the outside, and I have never been more glad to have been proven wrong. So invite them in it. I Never Wanted to Join a Sorority. Never. I never wanted to be in a sorority. Never. That wasn’t a big problem for me, especially because there was no opportunity to be a part of a sorority while I was an undergrad. It wasn’t anything I really put any thought into. Literally, I LOLed. Like I said, I NEVER wanted to be in a sorority, let alone live in a sorority house. To be surrounded by 30 sorority girls all the time? No thank you. But I still needed a place to live, so being a snob about sorority life didn’t feel so much like an option, especially not as my grad school state date approached. So I made some phone calls, applied for some jobs, and was eventually selected to be the Resident Supervisor (aka, House Mom) for the Alpha Gamma Delta chapter at Illinois State. I’ve never been more grateful for anything in my life. The year I spent serving those women changed my life. I expected to hate it. HATE it. I expected it would affirm all of my preconceived judgments about sorority girls. I expected to leave still knowing that I NEVER wanted to be in a sorority. That year taught me what sorority was really about, about the difference between “sorority girls” and real sorority women. It inspired me to do more research, do more learning, which is what lead me to work at Alpha Gamma Delta International Headquarters after graduation. Nine months into my employment, I came to work to find a fax on my desk; it was the recommendation for Alumnae Initiation, completed by the women of the chapter at Illinois State about me and why I should be a member of Alpha Gamma Delta; why I already was a member without having yet been initiated. Even now as I type this, I don’t have the words to describe what that felt like. But if you’ve ever been invited to join a group of women you admire and love, if you’ve ever been extended a bid to the organization of your dreams, you know exactly how I felt. Turns out I didn’t need one anyway. My initiation is still one of the most powerful moments in my entire life. It solidified the bond I’d built with Alpha Gams, sorority women and fraternity men, confirmed my passion for sorority and reaffirmed my life’s purpose. I wasn’t just a maybe-joiner; I was a never-joiner. Remember: I was NEVER going to join a sorority. Until each and every sorority woman I met defied the stereotype I’d built in my head. Until they taught me what it means to be a sorority woman. Until they invited me to get to know them before they asked me to join. Until they showed me their purpose. Until they asked me to. Today is the one-year anniversary of my initiation, and while I am grateful for uncountable moments and experiences I’ve had as an Alpha Gam over the last year, I am grateful for one thing above all else: being recruited. We have the power to change lives, to connect people to their purpose. The gift of membership has changed my life, and we have the power and the privilege to give that gift to men and women this year. Recruitment can be hard work; it can be stressful, time-consuming and exhausting. But from the perspective of a new member, man is it worth it. Find those stellar maybe- or never-joiners. Defy that stereotype. Teach them what it’s about. Get to know them. Ask them to join you. I had never heard this phrase before a couple weeks ago. I was attending the Phired Up Growth Summit with some of the brightest minds in the fraternity growth industry. It was here amongst colleagues, mentors, mentees, and an (almost) all male audience that I heard about the Chill to Pull (CTP) ratio. In an effort to fully understand this, I did a little research. I Googled (this gives me a scarlet letter in the research community by the way, but I digress). I Googled and amongst the rubbish I learned that CTP is defined as “The amount of chilling with your boys/pulling ladies one fratstar can achieve. Five to Five is the highest ratio. “ I learned that there is a whole website dedicated to Chill to Pull with a whole statistical equation on how calculate CTP. 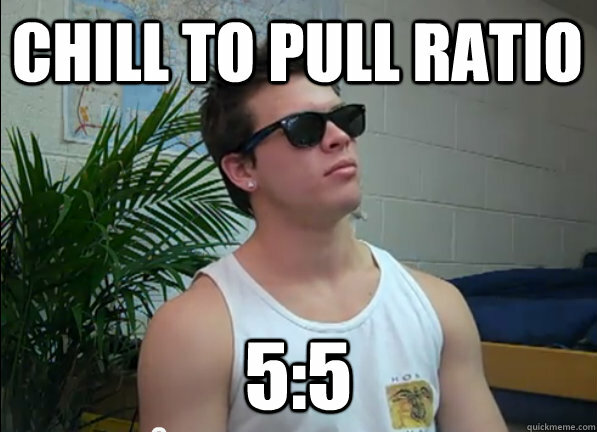 The remarkable gentlemen at Total Frat Move even promote an automatic CTP calculator…. As I was discovering the true meaning of CTP I was surrounded by respected colleagues and friends. I looked up from my keyboard and my eyes met those of my younger and smarter colleagues. There was a air of “So, doc- what do you think about this?” in their eyes- almost like they were waiting for me to go off on an all familiar rant about masculinity and how we need to be researching more on how this impacts group growth and how men must stop the madness in fraternity chapters. I did not do that. I mean, that’s all still true but instead I thought about how this might actually not be all that bad. Let me explain. Chill to Pull could fit into a Values-Based Selection Criteria quite easily. When we say “chill,” what do we really mean? We may mean someone we have fun hanging out with, a guy who just gets us, someone who is up for anything at any time, a guy that can provide friendship without drama and hassle, or a person who has our back. When we say “pull” we mean how many women will come around as a result of you. Why do you think women come around certain men and not others? I’ll tell you what I know- women want to be around guys that make them feel safe, help them have a good time, maybe they have a crush or they have an actual friendship with a guy. Women want to be around men whose company they enjoy and who respect them. They want to be around men who make them feel good and who are gentlemen. I suggest that having a high “pull” score actually means you are a values-centered gentlemen and having a high “chill” score actually means that you are a good brother. Let’s break this down a little further. 1. Is prospect A a guy we enjoy hanging out with? 2. Does prospect A have the ability to have our back in any situation? 4. Does prospect A have a personality that makes women want to be around him? 5. Does prospect A respect women and have the ability to help women feel safe at parties and outings we host? 6. Is prospect A generally non-creepy when it comes to women? Incidentally, I know some fraternity chapters do not intend for CTP to be this, shall we say, professional and polite. That’s ok- they are not even men who read this blog because they are too busy chillin’ and pullin’ and for your information- men that spend all their time chillin’ and pullin’ in college become adult versions of that very same guy and its UGLY. This is for you, horses , who do read what we share with enthusiasm. This is just a little nugget and reaction on a way to turn something that can be pretty sexist and lame into something that actually makes a lot of sense. By the way, my official CTP according to the online calculator is 2:1. We all know that my CTP is actually MUCH higher than that, so there is really no way that test is statistically valid anyway. Keep fighting the good fight, gentlemen. It does not do much good to make a “declaration of independence” if you are not committed to recruiting people into your cause. There are few stories as bold and inspiring as the founding of the United States. This 4th of July while we all celebrate Independence Day, I encourage you to also take a moment to honor the fight of the founding fathers by thinking about the causes that burn deep in your heart. Remember that its not enough to be passionate or pissed off! You must also recruit more quality people to your cause — otherwise your just another crazy/angry person with a big idea/problem. Recruiting people is what makes your purpose become a movement. One passionate person is noticeable. A growing throng of people passionate enough about their purpose that they will fight for it is REVOLUTIONARY.